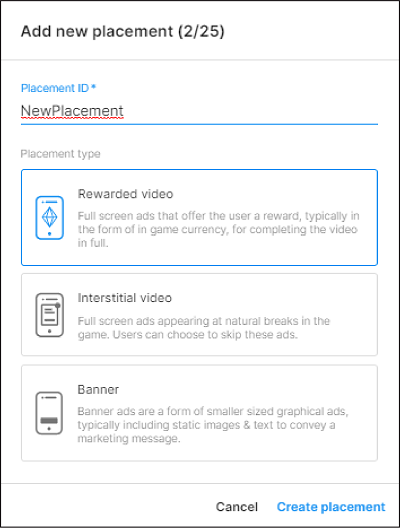 Placements are triggered events within your game that display monetization content. In this guide, you’ll learn how to configure, implement, and personalize Placements. From the Operate tab of the Developer Dashboard, select your Project. Select Monetization from the left navigation bar to view a list of your Project's monetization options. Select Placements to manage and create ad Placements. To create a new Placement, click ADD PLACEMENT to open the Add new placement configuration window. The Placement name you specify auto-generates a Placement ID, which you call in your code implementation. Note that you can change Placement name later, but once you create the Placement, you cannot change the corresponding ID. Select Personalized Placements to display both ads and in-app purchasing promotions, using machine learning-driven decisions about which to serve based on each player’s preferences and predictive LTV. Select Non-rewarded to show basic interstitial ads or promotional content. Non-rewarded Placements allow players to skip the ad after a specified period of time. Select Rewarded to allow players to opt-in to viewing ads or promotions in exchange for incentives. Rewarded Placements do not allow the player to skip the ad. Select Banner to create a dedicated Banner ad Placement. ‘video’ is a non-rewarded Placement that serves Video ad and Playable ad formats, and allows users to skip the ad after 5 seconds. ‘rewardedVideo’ is a rewarded Placement that serves Video ad and Playable ad formats, but does not allow skipping. Our best practices guide provides examples of effective implementation of ad placements. Click CREATE NEW PLACEMENT to configure the Placement’s settings. You can edit Placement settings at any time by selecting the desired Placement from the Placements menu on the dashboard. The available settings are defined below. To configure settings specific to each platform (iOS and Android), click the Options icon in the upper-right corner of the settings menu, then click Platform specific settings. 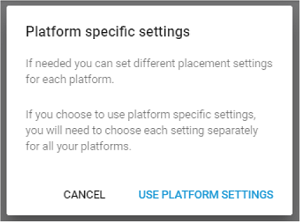 Once you enable platform-specific settings, you must configure separate settings for each platform. Click the Edit icon to specify the number of seconds after which users can skip ads in this Placement. Tip: To run rewarded ads in your Placement, set this option to No so that the video is not skippable. Choose Ads, IAP Promo, or both. Video ads are full screen video advertisements. Display ads are full screen static images. Playable ads are full screen interactive advertisements. With IAP Promo enabled, you can link Promos to the Placement, or click Create IAP Promo (for more information, see documentation on IAP Promo integration). 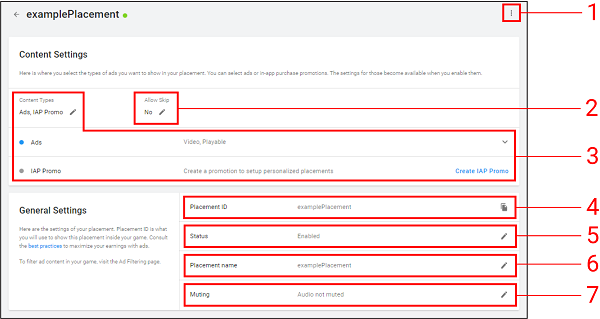 Note that IAP Promos must be enabled and linked in order to activate Personalized Placements. Placement ID is a unique identifier to reference in your code implementation. Once you create the Placement, you cannot change its corresponding ID. By default, a new Placement's status is Live. Click the Edit icon, then uncheck Enable Placement and click SAVE to change its status to Disabled. Disabled Placements will not show monetization content. Click the Edit icon to change the Placement name. Changing this setting does not impact the Placement ID. By default, ads for a new Placement are not muted. If you want ads in this Placement to default to muted audio, click the Edit icon, then check Mute audio . Initialize the Unity Ads SDK early in the game’s run-time lifecycle, preferably at launch. Unity recommends using the latest SDK (3.0+). In your code, check if Placement content is ready to display through your specified Placement. Retrieve the available content and display it. Personalized Placements optimize player experiences and lifetime value on an individual basis. Each player receives the most meaningful engagements to maximize player retention and revenue. Add high value in-game IAP promotions into your rewarded or non-rewarded Placement to supercharge your monetization performance. Unity’s machine learning algorithms show either your IAP offer or a video advertisement based on the highest predicted player LTV. Watch an example video that showcases rewarded Personalised Placements.